Coming to you from the heart of Thomas Jefferson's Academical Village, Academical is the official podcast of the Virginia Policy Review (VPR). The podcast is staffed by the Master of Public Policy students at the Frank Batten School of Leadership and Public Policy at the University of Virginia (UVA). VPR is not a part of or an agency of UVA. It is an independent organization responsible for managing its own activities and affairs. UVA does not direct, supervise, or control VPR and is not responsible for VPR's contracts, acts, or omissions. Executive Producer Joshua Margulies and Associate Editors Anna Higgins and Ashley Bultman travel to Washington, D.C. for a discussion with Michael Finnegan, President of Atlantic Media. Twitter | Facebook | LinkedIn 7th Annual National Journal Conference [video recordings] Editing: Joshua Margulies Music: Blue Dot Sessions Although this organization has members who are University of Virginia students and may have University employees associated or engaged in its activities and affairs, the organization is not a part of or an agency of the University. It is a separate and independent organization which is responsible for and manages its own activities and affairs. The University does not direct, supervise or control the organization and is not responsible for the organization’s contracts, acts or omissions. VPR's Editor-in-Chief Jack DiMatteo (@JackDiMatteo) sits down with Ned Price (@NedPrice), Director of Policy & Communications at National Security Action (@NatSecAction). Previously, Price worked as an analyst at the Central Intelligence Agency (CIA). He was brought on to the National Security Council under President Obama before briefly returning to the CIA under President Trump. The conversation touches on all this and more. Journal Submissions: http://www.virginiapolicyreview.org/submit.html [open until March 29, 2019] National Journal Conference: http://www.virginiapolicyreview.org/njc-2019.html [Saturday, March 30, 2019 in Charlottesville, VA] Editing: Joshua Margulies Music: Blue Dot Sessions Although this organization has members who are University of Virginia students and may have University employees associated or engaged in its activities and affairs, the organization is not a part of or an agency of the University. It is a separate and independent organization which is responsible for and manages its own activities and affairs. The University does not direct, supervise or control the organization and is not responsible for the organization’s contracts, acts or omissions. 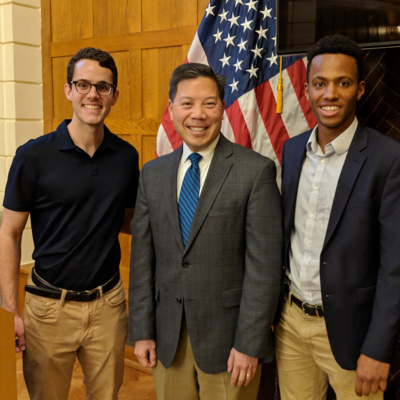 VPR's Editor-in-Chief Jack DiMatteo and Associate Editor Alexandre Fall sit down with Chris Lu (@ChrisLu44), Senior Fellow at UVA's Miller Center. Previously, Lu worked in the office of then-Senator Barack Obama, before eventually leading the Obama-Biden transition team. He then served in the Obama Administration as White House Cabinet Secretary before ultimately becoming Deputy Secretary of Labor in 2014. The conversation touches on Lu's education, government service, the 2020 elections, and the political and policy landscape, among other things. Journal Submissions: http://www.virginiapolicyreview.org/submit.html [open until March 29, 2019] National Journal Conference: http://www.virginiapolicyreview.org/njc-2019.html [Saturday, March 30, 2019 in Charlottesville, VA] Editing: Joshua Margulies Music: Blue Dot Sessions Although this organization has members who are University of Virginia students and may have University employees associated or engaged in its activities and affairs, the organization is not a part of or an agency of the University. It is a separate and independent organization which is responsible for and manages its own activities and affairs. The University does not direct, supervise or control the organization and is not responsible for the organization’s contracts, acts or omissions. Executive Producer Joshua Margulies, Executive Editor James Leckie, and Associate Editor Anna Higgins travel to Richmond, VA for a discussion with Robert Zullo, Editor-in-Chief of the Virginia Mercury. The conversation touches upon the site's mission, goals, reporting approach, and the state of journalism more broadly. Editing: Joshua Margulies Artwork: Brian Kim Music: Blue Dot Sessions Although this organization has members who are University of Virginia students and may have University employees associated or engaged in its activities and affairs, the organization is not a part of or an agency of the University. It is a separate and independent organization which is responsible for and manages its own activities and affairs. The University does not direct, supervise or control the organization and is not responsible for the organization’s contracts, acts or omissions. Ep. 2 - Interview with Virginia Secretary of Health and Human Resources Daniel Carey, M.D. VPR Executive Editor James Leckie interviews Daniel Carey, Virginia's Secretary of Health and Human Resources. Dr. Carey was appointed to the position in January 2018 by Governor Ralph Northam. Before holding public office he worked as a cardiologist and as an executive in the healthcare industry. Our interview touches on Medicaid expansion, the opioid crisis, needle exchange programs, and access to care more broadly. Research: James Leckie Editing: Joshua Margulies Artwork: Brian Kim Music: Blue Dot Sessions Although this organization has members who are University of Virginia students and may have University employees associated or engaged in its activities and affairs, the organization is not a part of or an agency of the University. It is a separate and independent organization which is responsible for and manages its own activities and affairs. The University does not direct, supervise or control the organization and is not responsible for the organization’s contracts, acts or omissions. In our very first episode we are joined by Matthew Olsen, Chief Trust & Security Officer at Uber. Olsen had previously led the Guantanamo Review Task Force, served as General Counsel at the NSA, and was appointed Director of the National Counterterrorism Center by President Obama. Our interview touches upon closing the prison at Guantanamo Bay, the NSA, the intelligence community, the Five Eyes, Olsen's new role at Uber, warrant canaries, and Silicon Valley culture. Executive Producer: Joshua Margulies Associate Producer: Shea Kearns Associate Producer & VPR Content Director : Anna Haritos VPR Managing Director: Ellen Beahm Although this organization has members who are University of Virginia students and may have University employees associated or engaged in its activities and affairs, the organization is not a part of or an agency of the University. It is a separate and independent organization which is responsible for and manages its own activities and affairs. The University does not direct, supervise or control the organization and is not responsible for the organization’s contracts, acts or omissions.